Marie of Hainaut. French medieval fashion. Home » Marie of Hainaut. French medieval fashion. 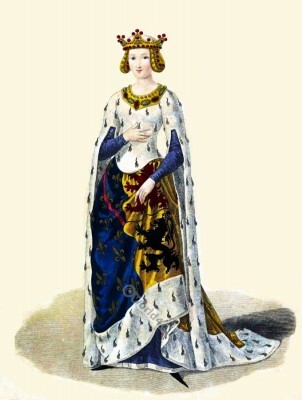 Marie de Hainaut (1280 – 1354). French medieval fashion. 14th century nobility. Marie de Hainaut also known as Mary of Avesnes daughter of John II, Count of Holland and Philippa of Luxembourg was married with Louis I, Duke of Bourbon. Louis Marie Lanté b. 1789. Galerie Française de femmes célèbres 1827 (Gallery of famous French women). This entry was posted in 1330, 14th Century, Burgundian dress, Court dress, France, Middle Ages, Nobility and tagged Burgundian fashion period, Crown, Gothic costumes, Medieval costume on 5/15/13 by world4.